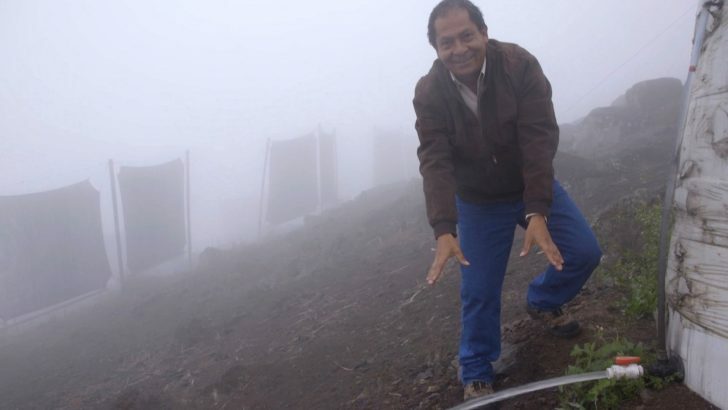 In Lima Peru lives Abel Cruz, better known as “The Fog Catcher”. In this city built over a desert this simple technology is helping to highly improve people’s lives getting water from the fog banks. Getting clean water shouldn’t be a problem when our own specie is already planning how to colonize Mars. However, it still is. Rural communities, especially ones situated at high altitude have difficulties at getting water for crops and daily use. Abel says he can get 200 to 400 liters of water per day per panel. The water is not drinkable yet, but it can be filtered for consumption. It Is usable for watering the crops. Essentially, a “fog catcher” is a construction of stems made of metal, bamboo or wood and a tight-knit mesh in between them. This allows fog to condensate into droplets of water that are collected by PVC gutters. Then, the droplets flow down, towards a trough and into a container where it is collected and measured. Water can also flow through an organic filter before storage. You will need a saw, a hammer and some 3-inch nails (7cm) and a ladder. Fix the stems firmly to the ground (dig in ¼ of it at least). Place them in a distance shorter than your raffia/mesh is, so that you can fix it well. Fix the raffia/mesh to the stems. Place the PVC pipes under the panel so that caught water will drop into it and flow into your tank/pond. Place the water filter before the tank.